South Cerney, UK, November 20 2017 – Leading provider of compatible optical networking infrastructure, ProLabs, has introduced its latest development to the world of transceivers with its new high-speed SFP- NBase-T transceiver. 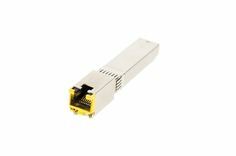 Ideal for bi-directional communication over copper cable, the NBase-T transceiver module is a high-performance integrated duplex data link, with the ability to support 2.5G transfer speeds at cable lengths of up to 100M using Cat5e cabling and 5G using Cat 6 Cabling. “More than 90% of structured cabling installed between 2003-2014 (approximately 70 billion meters) has been CAT5/6, with current technologies’ throughput on these cable types limited to 1Gbps. This will be a bottleneck to delivering bandwidth available from end points such as 802.11ac that have the capability to deliver greater than 1.3 Gbps with Wave 1 and greater than 2.3 Gbps with emerging Wave 2 products,” said Tony Lefebvre, VP Products & Marketing at ProLabs. With the advent of 802.11ac with Wave 2 Wi-Fi Access Point (AP) products delivering greater than 2.3 Gbps, customers need to address the backhaul connectivity which in the case of CAT5/6 is limited to 1Gbps with current technologies. When replacing existing previous generation AP’s, the NBASE-T transceiver enables customers to keep their CAT5/6 infrastructure intact while delivering the throughput required by the newly added 802.11ac AP. HD CCTV and high-performance computing also benefit from NBase-T’s greater throughput, allowing these and other bandwidth hungry applications to run at a higher rate over existing infrastructure, not only improving end user quality of experience but deferring costly cabling infrastructure replacement programs. The IEEE-802.3bz/NBase-T transceiver is SFF-8431 and SF-8432 MSA compliant with low power consumption and EMI emissions. It also features MDI/MDIX crossover with unshielded and shielded cable support, multiple loopback modes for testing and troubleshooting, built-in cable monitoring and link diagnostic features, and robust die cast housing. For more information on the NBase-T and other ProLabs products, please visit www.ProLabs.com. ProLabs is committed to transforming network connectivity. As a leading global provider of compatible optical network solutions, the company offers an extensive range of high-quality products including optical and copper transceivers; direct attach cables, media converters, active optical cables, and fibre cabling. With an unrelenting commitment to quality, service and support, ProLabs is the only mid-tier provider offering customisation and lifetime product warranties. The company’s global headquarters are located in Cirencester, UK, with offices in Minneapolis, MN USA and San Francisco, CA USA. For more information visit www.ProLabs.com.